Overview - From the acclaimed director of Infernal Affairs and The Stormriders, Andrew Lau, comes this live-action spectacular about the furious streetcar sport of "Drifting". Initial D raced its way to the very top of the Hong Kong's summer box office and is based on one of Japan's most popular manga. For 5 years, 18 year-old Takumi (Taiwan musical phenom Jay Chou in his big screen debut) has delivered tofu orders for his ex-racecar driving father (Anthony Wong). By night, Takumi ups the velocity and screeches his way around the dark slopes and narrow curves of the hills surrounding his home, perfecting the dangerous art of "Drifting". So fasten your seat belt and feel the adrenaline pumping full throttle as Initial D unleashes a new generation of racers...where speed alone is just not enough. After completing their superlative 'Infernal Affairs' trilogy, Hong Kong directors Andrew Lau and Alan Mak, along with screenwriter Felix Chong, turned their sights to lighter fare. 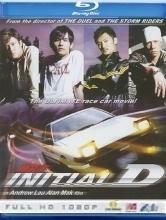 Based on a popular Japanese manga (previously adapted into an equally popular anime series), their live action 'Initial D' movie was an unusual international production. This story about Japanese characters was shot in Japan by a crew of primarily Chinese filmmakers and stars. The material, a tale of teenage street racers, is pure escapist entertainment, utterly lacking any pretense of the dramatic weight from their earlier work. Nonetheless, it made for some decent popcorn fun, and was a big hit throughout Asia upon release in 2005. Chinese pop star and heartthrob Jay Chou ('Curse of the Golden Flower') stars as Takumi, a socially retarded teenager who has developed amazing skills as a downhill racer without even realizing it. Forced by his drunken father (Anthony Wong) to make late night tofu deliveries down the twisty roads of Mt. Akina since he was 13 years-old, the boy simply desired to get his job done as quickly as possible. He had no idea that he was learning driving techniques that his car-obsessed friends would go crazy for. He's so good, in fact, that when finally introduced to the street racing subculture by bumbling comic relief sidekick Itsuki (Chapman To), Takumi is so bored that he can barely stay awake while flying through the dangerous course at insane speeds that no one else can match. However, when a group of professional racers get wind of the mysterious new talent putting them to shame, a grudge match threatens to make things a lot more interesting. 'Initial D' is set in a bizarro alternate universe where parents encourage their kids in illegal street racing, there are never any civilians or cops on the public roads, and no one ever gets hurt during even the scariest smashes and crashes. Unbeknownst to Takumi, his father was once a legendary racer who has tricked out their modest Toyota AE86 with a professional grade racing engine and suspension. Years of verbal abuse have served to drill dad's driving abilities into the boy's head. By following his old man's footsteps and becoming a gifted racer, son and father finally bond. The story isn't particularly psychologically complex. Things take a strange misogynistic turn when Takumi discovers that his girlfriend (Anne Suzuki, star of 'Returner') has been working as a whore the whole time they were dating, a subplot that comes from out of nowhere and seems to have no real point or purpose. On the plus side, the movie is a slick and flashy production that frequently mimics the freeze frame and split-screen aesthetic of the anime series. The many drift racing sequences (the type recently adopted for 'The Fast and the Furious: Tokyo Drift') are thrillingly staged, with an intriguing emphasis on the technique of the sport. His footwork, shifting, and steering prove more important in Takumi's victories than speed alone. Some of the race scenes are enhanced with CGI, but not overdone like those 'Fast and the Furious' movies. Jay Chou is rather stiff as the lead; instructed to be stoic, he crosses the line into boring. Fortunately, the rest of the cast seems to be having a good time. The ever-reliable Anthony Wong (supporting actor from about half the movies made in Hong Kong over the last decade) reportedly got into character by spending the entire shoot drunk. No, 'Initial D' is certainly not a work of art, and may seem like a tremendous disappointment from the creators of 'Infernal Affairs', but taken on its own terms is a modestly entertaining way to spend 109 minutes. 'Initial D' marks the first Blu-ray release from Tai Seng Entertainment. As is typically the case with the studio's DVD output, the Blu-ray appears to be a direct import and repackaging of a disc previously released in Hong Kong by MegaStar. To that end, the American cover art, which boasts the tag line "The ULTIMATE race car movie! ", looks like it was designed by a 4th grader with rudimentary Photoshop skills. Shot primarily at night on an inexplicably well-lit stretch of mountain round, 'Initial D' has very slick and glossy photography that emphasizes the striking contrast of stark whites against inky blacks. The Blu-ray's 1080p/AVC MPEG-4 transfer captures it fairly well, with some notable weaknesses. The image is reasonably sharp, but suffers from mild yet nearly constant edge enhancement processing that causes slight ringing artifacts and saps away fine detail. Film grain, when it appears, is a bit noisy. Daylight scenes tend to look especially dull and filtered, and black levels fluctuate during night scenes (though they're more solid here than on the DVD edition). Colors are generally vibrant, but for some reason the gas stations uniforms are a flat red that never pops off the screen as you'd expect. The video has all the signs of being excessively "tweaked." It will probably look fine on smaller displays, but the larger your screen, the less impressive it seems. That isn't to suggest that the disc looks bad, just that it falls short of greatness due to these deficiencies. It's also worth noting that the aspect ratio measures a bit narrower than the listed 2.35:1, coming in around 2.30:1. Also, most of the license plates in the film have been digitally blurred. The same blurring is found in the DVD version. Since the movie wasn't released theatrically in this country, I can't be sure whether this effect is inherent to the film or was added for home video. If the video wasn't all that it could be, I have no such complaints about the audio. The Cantonese PCM 5.1 soundtrack is a supercharged powerhouse of revving engines and screeching tires. The extensive use of hip hop music throbs in the low end and offers excellent fidelity in the mid-range. The surround channels are used to great effect as cars aggressively pan through every channel, creating an immersive three dimensional sound space. 'Initial D' is a tremendously fun audio experience. Actress Anne Suzuki's dialogue is quite visibly out of sync with her lips in almost every scene, but I expect that she was speaking Japanese on camera and that her performance was dubbed. I don't count that as a flaw in the disc's audio transfer. The English subtitle translation is a little stiff but sufficiently coherent. Subtitles appear mostly within the movie image, but dip just far enough into the lower letterbox bar to be a nuisance for projection viewers with 2.35:1 screens. Additional subtitles are offered in Traditional and Simplified Chinese. The Cantonese language soundtrack is also provided in adequate but lesser-quality Dolby Digital 5.1, as are Mandarin and English dub tracks for audiences afraid to read subtitles. Almost all of the bonus features from the 2-disc DVD edition have been carried over to the Blu-ray. Unfortunately, all of the content is pure Electronic Press Kit fluff. Behind the Scenes (SD, 16 min.) – A series of short sound bytes about the comic book source, production in Japan, the cars, and filming the race scenes. Characters (SD, 14 min.) – Video snippets about the actors and the characters they play. The only remotely interesting part comes when Anthony Wong, ever the Method actor, explains his preparation for playing a drunken souse. The Making of Initial D (SD, 20 min.) – Take all of the footage already seen in the earlier "Behind the Scenes" featurette, jumble up the order it appears, add in a couple extra minutes of filler material, and then you'll have this "Making of" special. Deleted Scenes (SD, 2 min.) – 10 short scenes in cruddy video plastered with time codes and only production audio. None of these scenes was needed in the final cut, but there are a couple of funny bits with the fathers. Outtakes (SD, 5 min.) – The expected flubs and joking around. Promotion in Shanghai (SD, 10 min.) – A publicity event staged by the studio, this piece has no speaking or narration, just 10 tedious minutes of stunt drivers spinning around in circles on a race track. Promotion in Japan (SD, 3 min.) – Even less interesting, here we have a montage of actors standing at press conference podiums, again with no speaking or narration. TV Spots (SD, 5 min.) – Three commercials: 15-second, 30-second, and 60-second. Trailers (HD, 5 min.) – Three trailers: one emphasizing the racing, one emphasizing the cast, and one emphasizing the plot. All of the supplements are presented in their original Cantonese audio with optional English subtitles. I can think of at least a dozen Hong Kong movies that Tai Seng distributes in this country that I would rather see on Blu-ray first, but 'Initial D' serves its purpose as their debut on the format well enough. The movie is lightweight entertainment, fun but insubstantial. The Blu-ray has decent picture, terrific sound, and a bunch of fluffy supplements. It's worth a rental.